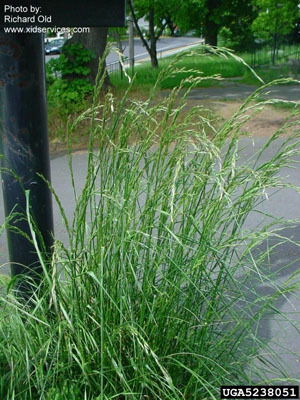 Festuca pratensis. (Schedonorus p.).Richard Old, XID Services Inc., Bugwood.org.www.fs.fed.us (Accessed 6/2014). 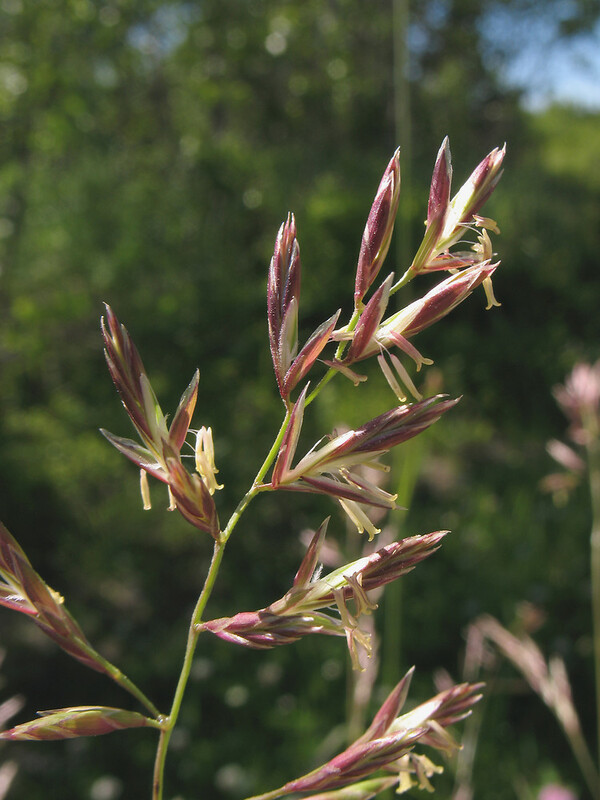 Schedonorus pratensis is a perennial, C3 grass (Wand et al. 1999), coarse, (much like S.. elatior) tufted. flowering stems to 1.2 m tall, smooth, base often bent (kneeling), very tough (Gargiullo pers. obs. ), old sheaths, shredding to fibers. Leaves alternate blades lax, not ridge-veined, to 0.5 cm wide, lobed at base (auriculate), lobes hairless, ligule very short, sheaths smooth. Flower spikelets 1.0-1.5 cm, 4-10 flowered, glumes unequal, the first awl-shaped, 0.25-0.4 cm, the second 0.35-0.5 cm, 3-5 veined, lemmas to 0.7 cm long, 3-5-veined, acute, usually awnless, anthers ca 2 mm, spikelet axis completely or almost smooth; inflorescence 10-25 cm, contracted after flowering, erect or nodding at tip; blooms June-July. Frequency in NYC: Infrequent in natural areas. Possibly more common along roadsides. Habitat: Open areas, lawns, meadows, roadsides. Mostly a lawn grass.